As my DnD campaign is nearing it’s finale I’ve found some extra time to work on some other good stuff – namely, my boardgame project, Armyland. 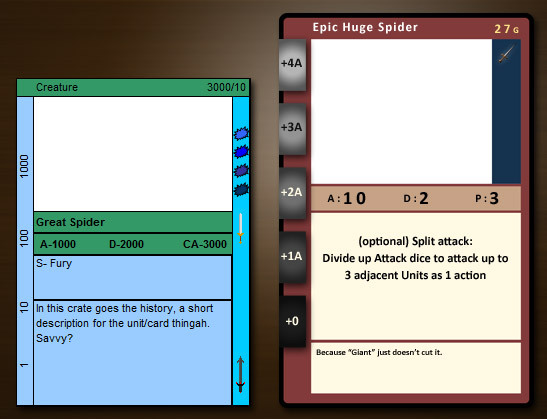 In the spirit of Almost Being Done With Card Design For The First Prototype, here’s a fun image for you all: the original card design I made back in high school, when the game sucked, and the current design. Both missing art, unfortunately. But still… the times, how they’ve changed things. The background your example is posted on looks better than the old cards. Still, kudos on the upgrade. I have been entertained. Very cool, great improvement on the new design. When you’re ready to give the game a test drive I’m totally up for helping you try it out. I’m anxious to see what you’ve come up with. Is it completely card driven or is there a board of some sort as well? I can’t quite remember how much detail you went into the last time you talked about it. I’m hoping to get my first game to a playable state this year. I’ve gone through so many different version trying to get the core mechanics of the game to both be fun and line up well with the theme but I think I’ve finally got something good. Maybe we can get together once both games are playable and see how badly we can break them. Snugs, I like the way you think. I’m especially open to having someone like you test the game without me explaining the rules… to make sure the rulebook as written makes sense. My brain tends to fill in the gaps with stuff I know but may have forgotten to write down. Will Armyland be playable by March 4th/5th/6th? It’s highly possible, actually.